Are videos that encourage kids to exercise helpful or hype? 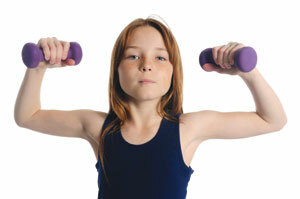 One of the most important healthy habits to instill in children is exercising. Most medical doctors recommend 60 minutes of physical movement per day, but check with your child’s pediatrician to make sure. Believe it or not, child workout DVDs offer affordable and easy-to-order tools to get kids off the couch and moving. But which DVDs are best? A pediatric psychologist and a physical therapist who specialize in obesity treatment and prevention reviewed the following DVDs on a variety of criteria. Plus, the real experts, kids, weighed in on what they thought of the videos. Use the information to choose titles that seem best for your family. You can generally rent the DVDs from the library or your local video store to try them out before purchasing. Plan for exercise by reserving a specific time each day for your child’s physical activity. Include the DVDs; however, don’t limit yourself. Look at all options for exercise in your area, including children’s programs, organized sports, athletic facilities, gyms, swimming pools in warm weather months and outdoor play. At the beginning of the week, plan what physical activity kids will do each day, with a backup idea if the weather does not allow for the activity. Sometimes you can invite children’s friends to join your family. Also allow for changes in the scheduled activity if they are appropriate; that is part of the fun! And model the joy of movement by exercising with your kids. Show them you enjoy physical activity and they will, too. You’ll be building good habits for yourself and your children. Wendy Ward-Begnoche, Ph.D., is an associate professor of pediatric psychology and is affiliated with the Arkansas Children’s Hospital and Dennis Development Center, Little Rock, Arkansas. Vicki McNeill, PT, DPT, has been employed in various settings in her 25 years as a physical therapist, yet over the past five years has had a special interest in physical fitness first in a geriatrics setting and now pediatrics. Allyson Phillips, BA, is a graduate student at the University of Alabama concentrating in developmental psychology with an emphasis on intellectual disabilities.